The dachshund is an energetic, lovable dog breed with a big personality. Known affectionately as the doxie, wiener dog, hotdog, or sausage dog, this breed of short stature leaves a lasting impression. The dachshund is bred as standard or miniature size, but traits of this breed are similar for both sizes. The dachshund can be a loving companion, lapdog, and even family dog. Despite its size, the dachshund tends to be quite protective and alert, so the breed can also make an excellent watchdog. Coat varieties include smooth (short-haired), longhaired, and wirehaired. Dachshunds come in a wide variety of solid colors or combinations of colors including (but not limited to) black, tan, fawn, beige, blue, chocolate, and red. Various markings are as follows: dapple, piebald, brindle, sable. The dachshund originated in Germany as a hunting dog. Though the breed's origins can be traced as far back as the 15th century, the breed development really began in 17th century Germany. Called dachshunds, which translates as "badger dogs," these short hounds did just that—hunted badgers. Their short legs, loose skin, big chests, determination, and independence were ideal for digging, entering tunnels, and fighting badgers. Their flap-down ears help keep dirt and debris out of their ears when burrowing. Further development of the breed created two sizes. The standard size continued to hunt badgers as well as wild boar, while the miniatures pursued hare and foxes. There is also a middle size in Germany. Dachshunds were brought to the U.S. as early as 1885 but increased in popularity in the 1930s and 1940s. To prevent them being ostracized during World War II, they were temporarily called badger dogs in the U.S. They remain extremely popular dogs to this day. Dachshund races, known as "wiener races," are popular in some places for amusement. However, these are opposed by the Dachshund Club of America out of concerns over whether racing might injure the dogs. Grooming needs of the dachshund depend upon hair coat. The longhaired variety requires daily brushing but does not typically need professional grooming. Smooth dachshunds have a higher shedding rate than other varieties. All dachshunds should receive baths as needed (more if skin problems exist). Be sure to do regular nail trims in order to prevent problems with the feet. Those flap-down ears also need attention to keep clean and monitor for signs of infection or mites. Maintain good oral hygiene by brushing your dog's teeth a couple of times a week. 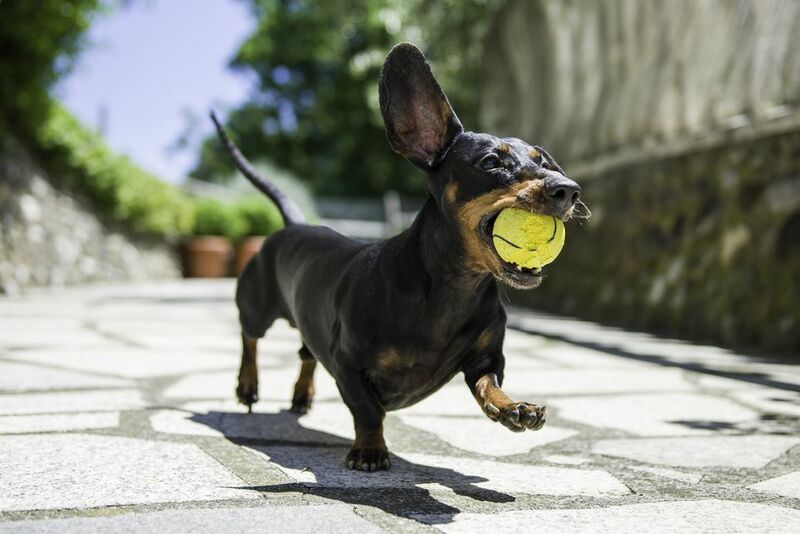 While loved for its bold personality, the dachshund may have a tendency to be stubborn, protective, and defensive. Many dachshunds are also known for their tendency to bark. Proper obedience training can turn these potential problems into beneficial qualities. They are tenacious, which was good in a hunting dog, but they might annoy you with this trait at home. Dachshunds are naturally prone to develop obesity. To avoid weight gain, your dachshund should get regular exercise. Daily walks are recommended, with a couple of 10-minute walks per day at the minimum, plus some play time, such as playing fetch. But proper nutrition is also key and you should be sure to avoid overfeeding. You will need to take care to protect your dachshund's back. As many as 25 percent of dachshunds have intervertebral disc disease, which can result in their spinal discs deteriorating and being susceptible to bulging when they have back strain or injury. Support the dog's back when handling him. Jumping up and down from furniture should also be discouraged. You might provide ramps or steps for getting up and down from chairs or beds. Dachshunds can be difficult to housebreak. You will need to be persistent and you may wish to use crate training. Be prepared with puppy pads and cleaning supplies. The propensity to dig may result in damage to your potted plants and yard. Keep that in mind and provide alternative activities for your pet. The dachshund may not be the ideal breed to have around small children unless you take measures to train and socialize the dog extensively. In general, this breed will do better if raised with kids rather than introducing kids later in life. You will especially need to coach your children to handle this dog safely as his long back can be injured when handled inappropriately. Dachshunds have a high prey drive, so they may not be a good match for a household that includes pet rodents. They usually get along well with other dachshunds but tend to want to be the top dog in a multi-pet household. The amount of food needed will depend on the size of your dog, activity level, age, and other factors. Be sure to provide high-quality food and monitor your dog's intake and weight. Take action early if you notice your dog is getting overweight and talk to your veterinarian about the appropriate feeding schedule, type of food, and amount to keep your dog at a healthy weight. This will help your dog achieve its natural lifespan. As with any breed, if you think the dachshund is right for you, be sure to do plenty of research before obtaining one. Talk to other dachshund owners, reputable breeders and dachshund rescue groups to learn more. There are many different dog breeds out there. With a little research, you can find the right one to bring home. What Is the Maltese Dog Breed Like as a Pet? Is the Tiny Yorkshire Terrier Right for You? Should You Get a Rottweiler? Is a Doberman Pinscher the Right Dog for You? There's a lot you need to know to make things go smoothly with your new friend.